National Zoo Keeper Week is celebrated during the third week of July each year. As the need to protect and preserve our wildlife and vanishing habitats increases, zoo keeper’s roles as educators and wildlife ambassadors become more essential. Throughout this week, Newport Aquarium will highlight members of our dedicated animal husbandry staff. 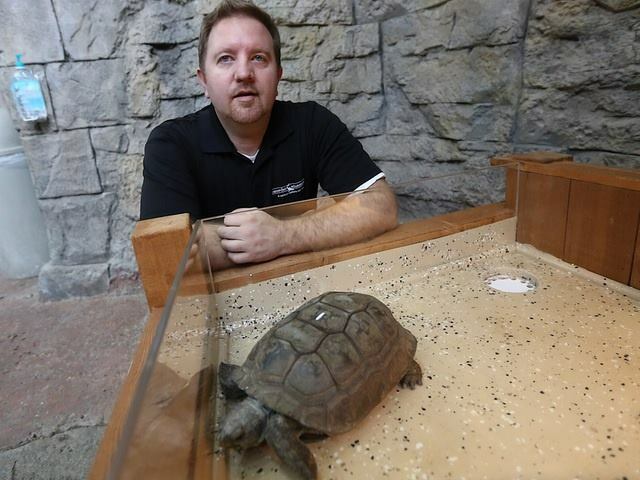 Jeff Gibula has worked at Newport Aquarium since before it opened in 1999. What has been the most rewarding experience while working at NAq? The “light bulb” moment…the very second that something we created is both in harmony for the animals and inspires, excites / enlightens any of guests. Hopefully creating a connection, a respect for all wildlife and wild places when they are outside of the aquarium. What’s your favorite part of your job? Working with exotic animals from around the world. How and when did you decide to get into the zookeeper field? I was born in Baltimore, Md. and at a young age started visiting the National Aquarium in Baltimore (NAIB). I believe my first time was when I was 4 years old. I was inspired and in awe of the facility and told my father that I was going to work their one day. Less than 20 years later I fulfilled that promise and was working at NAIB. This entry was posted in Zoo Keeper Week and tagged animals, aquarium, husbandry, zookeeper by NewportAquarium. Bookmark the permalink.